“There is no substitute for hard work”. (a) Derive an expression for the electric potential at a point on the axis of the disc at distance x from its centre. (b) What is the electric potential at the centre of the disc? (c) A positively charged particle of mass m and charge q with specific charge (q/m) of 8ε0g/σ is released from rest from a point P on the axis of the disc. 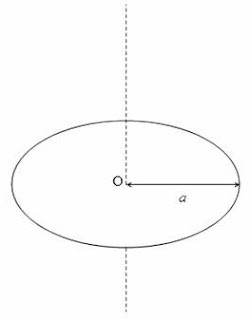 The distance of point P from the centre of the disc is d. If the particle just reaches the centre O of the disc, determine the value of d.
(d) Explain qualitatively the nature of motion of the charged particle after its release from the point P stated in part (c) above. Try to answer this question. This carries 15 points and you can take 15 minutes to answer it. I’ll be back soon with a model answer for you so that you can compare your answer with it and get an idea of your strength and weakness.